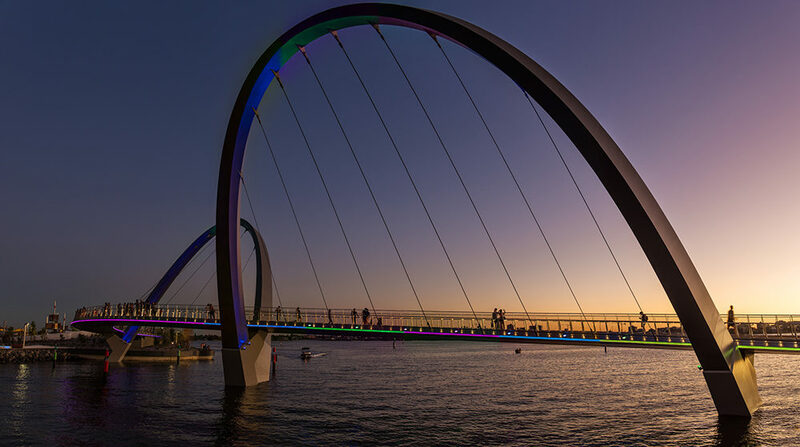 Elizabeth Quay Pedestrian and Cyclist Bridge is an integral part of Perth’s master plan to connect the city back to its waterfront and revitalise the city’s central business district. 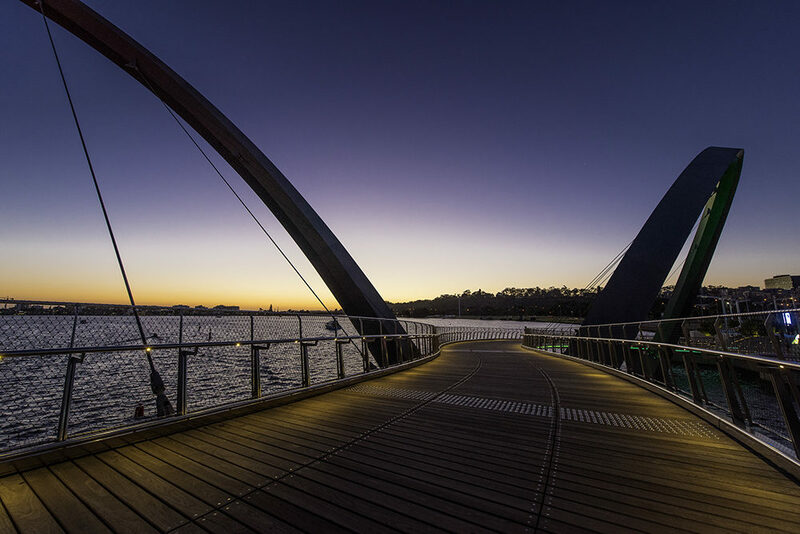 The bridge serves as the crucial link between The Island, the western promenade and Williams Landing, and it accommodates a popular access route for pedestrians and cyclists. 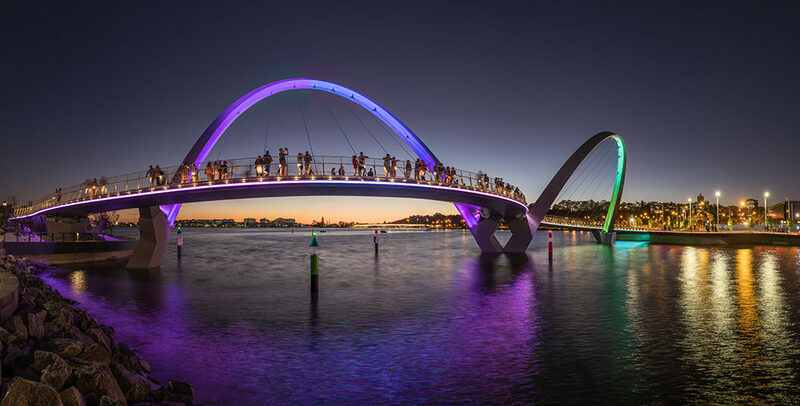 Officially opened on January 29, 2016, Elizabeth Quay Bridge has already achieved iconic status as a Perth landmark. The bridge was conceived to maintain the well-used “around the bridges” circuit popular with cyclists and pedestrians, while accommodating the passage of ferries. There was also a desire to exploit the prominent location with a visually striking architectural feature. The architecture called for a transparent balustrade, but it also needed to have enough solidity to withstand wind impacts. 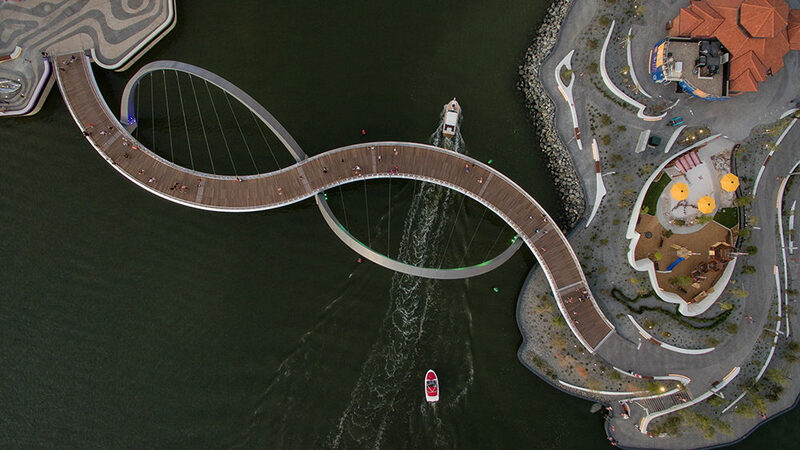 The balustrade design follows the bridge deck curves in plan and also leans in and out vertically, twisting like a ribbon along the length of the bridge. 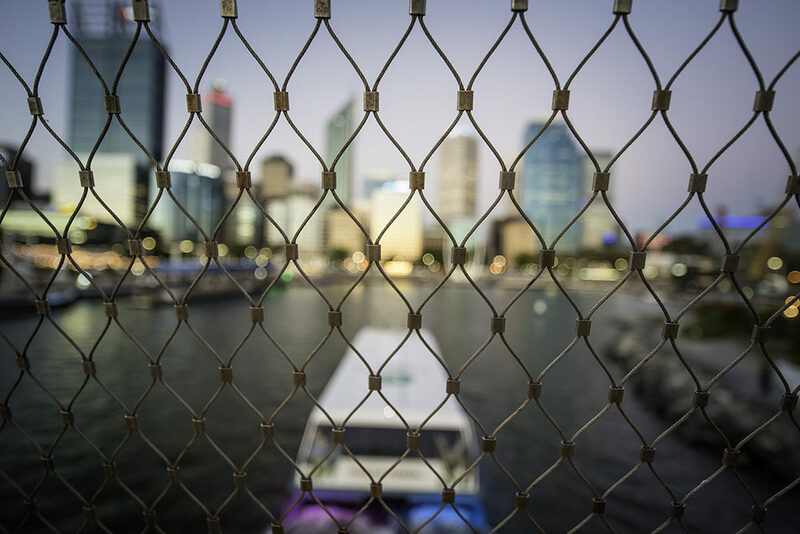 Responding to the technical challenge, Tensile Design & Construct developed a customised version of webnet mesh with a 50mm aperture and 2mm wire that was clear of obstruction, enhancing its capacity to conform to the support structure like a piece of fabric. The result met the design intent without compromising safety – the mesh is engineered to tolerate the highest crowd loads in the National Construction Code. The mesh was sized into eight panels, matching them to the curves on site and integrating with the balustrade. Tensile was responsible for the engineering of the balustrade and acted as consultant first before providing the final solution as a contractor. This enable an almost seamless integration of the rails and mesh enabling the sections to be joined to create two continuous pieces. With the modular strategy optimising the efficiency of the installation, the work was completed ahead of schedule. 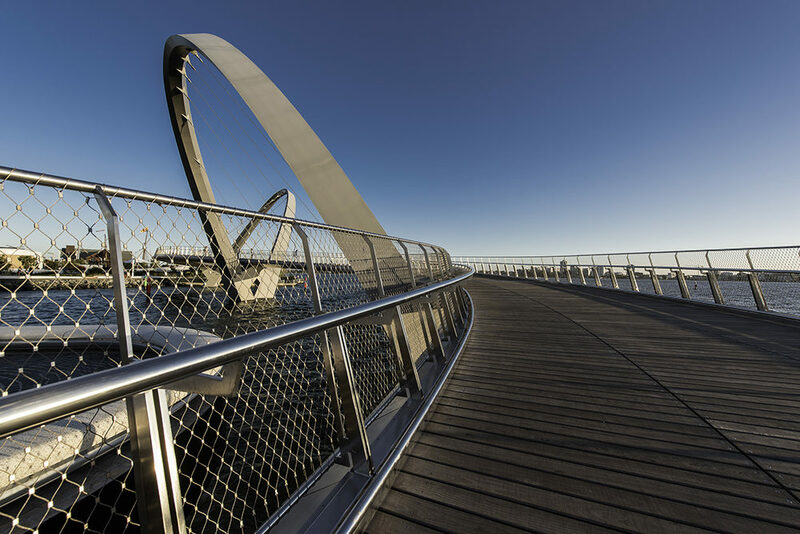 The architects sought to achieve “simple and pure structural forms” for the Elizabeth Quay Pedestrian and Cyclist Bridge; webnet mesh was one of the products that helped them reach that goal. 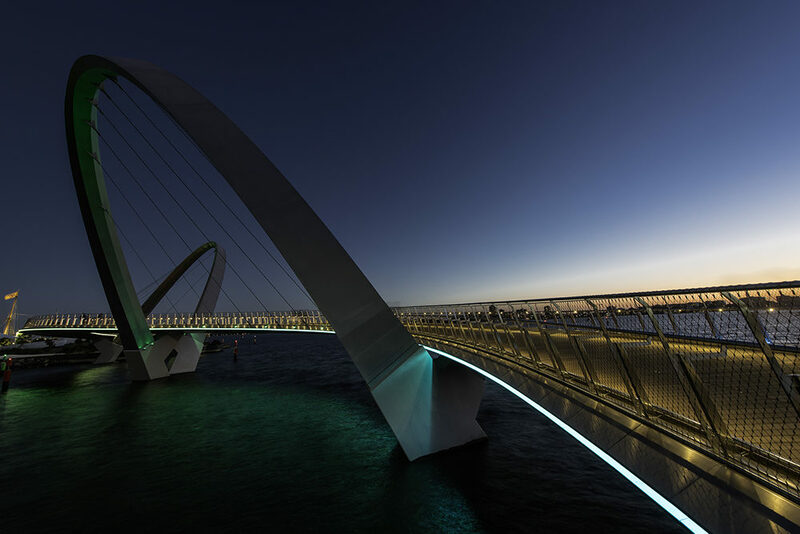 Tensile’s ability to respond quickly with a customised, modular version of webnet mesh to meet the specifications for the design contributed to the timely completion of the bridge for our client, contractor DASSH. Contact Tensile to see how we can assist with the versatility of webnet mesh.